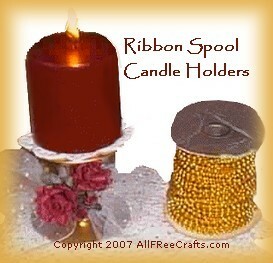 These candle holders are so pretty and elegant that you’ll never guess that they are made from recycled ribbon spools. Best of all, we are reusing something that otherwise would end up in the trash. That’s what I call trash to treasure! 1. Paint the entire spool in gold paint, or in your choice of color, and let dry. 2. Wrap the center section of the spool in a length of tulle or ribbon, tying a pretty bow. At the center of the bow, glue some silk flowers and green leaves. 3. Place a doily on top of the spool, then top with the candle. That is all there is to it! 4. To make a smaller version, take a tea light candle and remove it from its tin. Snip the edges of the tin with old scissors to fold down like flower petals. Paint gold. Let dry and replace the tea candle, then place the tea candle atop the candle spool holder. I really enjoyed making these, and the end results are beautiful. However, as with any candle craft, be aware of all safety concerns and follow safety precautions. NEVER leave a candle burning attended. We are not responsible for accidents or mishaps if you reproduce this craft and hurt yourself or someone else. Please be careful and only light a candle when you are absolutely sure it is safe to do so.